(MoneyWatch) Want to cook eggs, toast and brew coffee at the same time using a single device? Or perhaps you're interested in making your own dog treats? Later this year, you'll be able to do all that using new gadgets that come in dozens of colors and have many different functions. At the International Homes and Housewares Show, which wrapped up Tuesday in Chicago, thousands of companies showed off the latest and greatest home products, particularly those geared toward the kitchen and entertaining. This upcoming year, you'll be able to make just about anything on your own, including dog treats and soda, and you can buy your cookware in almost any color imaginable. Your appliances will have multiple functions, and your kids can even help you make their own meals, even sushi. There are plenty of new kitchen gadgets on the horizon, but here are five exciting trends for 2013. Color was the biggest trend seen this year, and it was everywhere. 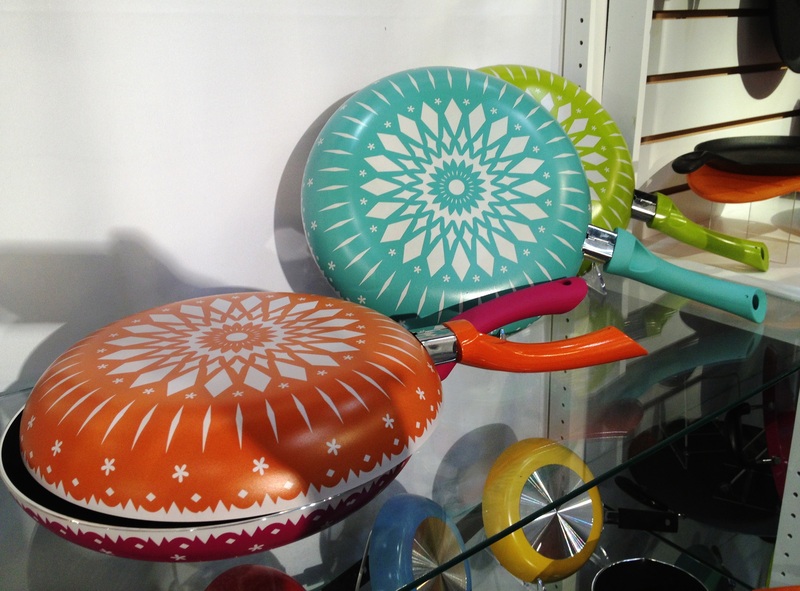 There were colorful designs on everything from spatulas to the bottom of frying pans to small kitchen appliances. The biggest colors seen in almost every product lines this year were lime green, magenta, teal blue and orange. While the DIY spirit may not involve purchasing a lot of products, cookware companies have certainly capitalized on the trend and have a lot to offer to help you help yourself. Holstein Housewares offers a press for almost anything: empanadas, brownies, cookies, cakes, burgers, waffles and omelets. Popcorn makers, including this one from West Bend, were very popular at the show. The dome of this particular model detaches and turns into a bowl. If your toaster just spits out toasted bread, then it's out of date. This Breakfast Deluxe Center will make you four cups of coffee, toast your bread and, using the heat from the toaster, make eggs on the top. It's like an Easy Bake Oven for adults. If you're in the market for a rice cooker, or a steamer, or a slow cooker or a pressure cooker, why not buy all three in one? Some multi-functional cookers, like this one from West Bend, have dozens of different uses in one device. Wilton Armetale showed off its line of serveware that you can also cook and grill with. The heavy-duty metal pots and pans can be thrown in the oven, over the stove top or on the grill and then immediately set on the table to serve. They keep your food warm longer and cut down on dishes. Cubodira is a collapsible dish rack. Not only can it be put away when it's not in use, but it doubles as a cutting board. You can cut up dinner on it, then wash the dishes and leave them to dry on the same device. Several small companies offered different products that were perfect for a hands-on dinner party that could also get kids involved in cooking safely. This raclette can cook all kinds of small, fondue-inspired recipes from Anne Lawrence's Conversational Cooking book on your table. While other raclette grills heat up electrically, these are lit by simple tea candles in a matter of minutes, perfect for an entertaining meal for guests or kids. The Rice Cube can turn regular rice and other ingredients into a cube of sushi in just one quick movement, so guests at a dinner party or even your kids could make their own sushi. You stuff the cooked rice -- any kind, you don't have to make specific sticky sushi rice -- into the small cube with any other ingredients of your choosing and voila, sushi. Wrap it in seaweed or cover it in seeds and it's ready to eat. Given all the color seen at this year's show, it's no surprise that even the most mundane kitchen items were jazzed up, including your everyday sponge. Casabella also showed off a one-of-a-kind mop with rhinestones. Broksonic offered these sleek, colorful humidifiers, which also had options for aromatherapy. At their base, they're still humidifiers like you'd see sitting on the shelves of a big box store, but much prettier to look at.